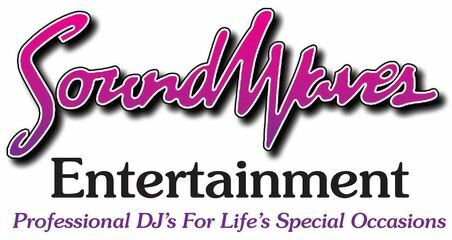 Soundwaves Entertainment providing Professional DJ’s for FUN Corporate Party Entertainment in York, Harrisburg, and Lancaster, PA as well as Baltimore and Westminster, MD Areas Since 1983! Soundwaves Entertainment can provide music and entertainment for any type of Corporate Event. Whether you’re planning a Company Picnic, Banquet, Meeting, Conference, Convention, or Employee Christmas Party, Soundwaves Entertainment will make your event a success from start to finish. We specialize in Fun Corporate events! We are more than just DJ’s! We offer many Additional Services including Photo Booths, A Photo Lounge which can accommodate up to 10 guests per photo, HD Media Projectors, Large Projection Screens and Flat Screen TV’s for Media Presentations, Karaoke, Music Videos (We have videos from Motown to Today’s Hits and everything in between), Up Lighting Packages, Special Effects Lighting , A Custom Monogram light with your company name or logo that can be projected on a wall or on the dance floor and even a snowflake monogram for Winter themed holiday parties! Let us help you design a package to make your next corporate event the most talked about event of the year! It’s no secret, a DJ can either make or break an event! For over 30 years, our clients have trusted Soundwaves DJ Entertainment to make their wedding or special event a success from start to finish! With over 25 years in the business, when it comes to Corporate Parties – let’s just say we’ve seen it all! We’ve put together some helpful planning tools and resources to help make your event planning easy! What does the Corporate Package include? A fully customized music selection – for your event from our Most Requested Song Lists. You choose the songs that you prefer your DJ to play or the songs that you think your guests might like as well. You can also provide a “Do Not Play List” of specific songs or types of music that you prefer not to have played. One of the biggest music selections in the area – Soundwaves music library is constantly being updated monthly to ensure that we have the Hottest, Latest and Most Up To Date, Top 40, Club, Hip Hop, Techno, Rock and Dance Hits as heard on such local Radio Stations as “KISS FM” or “FM 97”! We subscribe to a national music service that provides us with all the hottest new releases every month so that we always have the current songs that are played on the radio! We only play the “clean” OR “radio version” of today’s popular hits that are edited for explicit language and content. Wireless microphones – for your use for presentations, service awards, door prize giveaways, guest speakers, etc. Your DJ will interact on the mic with your guests – and get them involved in group participation dances such as the Cha Cha Slide, Cupid Shuffle, Apache (Jump On It), Cotton Eyed Joe and more. We can also incorporate games and trivia with prizes into your package to break the ice after dinner and get everyone involved. Our Basic light Package is “Free” with every booking! 24/7 access to our Online Event Planner – so you or your guests can requests songs, create an event playlist and change your event details from home, work or from your phone! All prices and packages include set up and break down of equipment. – We arrive 1.5 hours prior to your guests’ arrival at your venue for set up and a sound check.